Upgrade Sony to Pioneer Drives: Some customers prefer Pioneer drives over Sony drives. We think Sony drives work perfectly. If you wish to enable your device with LightScribe, DO NOT upgrade to Pioneer. 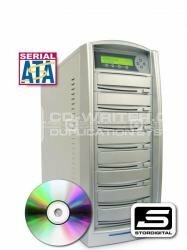 By preventing environment damage you can be assured that your StorDigital NetBurner DVD CD duplicator will offer you reliable service for an extended period of time. The StorDigital NetBurner really is an amazing DVD and CD duplicator that is ideally suited to a professional environment where strong and reliable performance is required. Built-in Hard Drive with Partition/Image Name Editing: Simply stated you can name the images stored on the hard drive partitions. Industry leading 256MB buffer memory: Optimizes duplicating quality. Supports all currently available DVD media including Double/Dual layer DVD9: Can duplicate Single Layer DVD Æ’ † ™ š ±R/RW and Double/Dual Layer DVD-R Formats. DVD Reader 18x Drive *Not applicable to HDD to 8 and HDD to 10 unit. StorDigital . SD7DVD . NetBurner . network . attached . CD . DVD . duplicator . Systems .